NAGA CITY – Police City Director Sr/Supt Filmore Escobal confirmed today that two members of the Naga City police tested positive for the use of illegal drugs. This is the result of the just concluded random drug tests initiated by his office, Escobal noted. 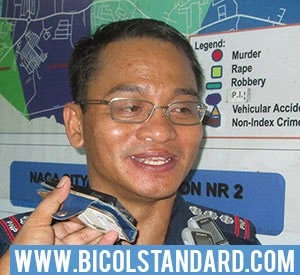 In an interview by BICOL STANDARD, Esbobal reiterated his stern warning against police officers who are using drugs, saying that they will be dealt with accordingly. He further warned that the random drug tests in an ongoing program that intends to cover all police officers here. “We should serve as the best example to the community,” he said. Upon his assumption to office as PNP City Director, Escobal met with the city officials to present his approach to curb all forms of criminality. He also activated the members of the Peace and Order Council (POC) who will be his partners in planning other activities related to crime prevention. Meanwhile, in an interview over DWLV, he explained that he want to rally the participation of all Barangay Officials. “Even ordinary residents are encouraged to participate in the crime prevention campaign,” he said. “We are of the belief the most of the crimes that occur here are related to drug abuse. That is why want to tap the help of all our barangay officials to consider our anti-drug abuse program,” Escobal explained.